So it comes as no surprise that this is where the dynamic development company chose to build one of its latest offerings – the 116-unit residential complex of Queen’s Park Place. Designed by Simpson Haugh and Partners, the scheme includes both private and affordable housing, linked by landscaped, secure open spaces. The complex includes three brick L-shaped blocks, partly clad in zinc and cedar panelling, and amenities such as 24-hour concierge and car parking for residents. 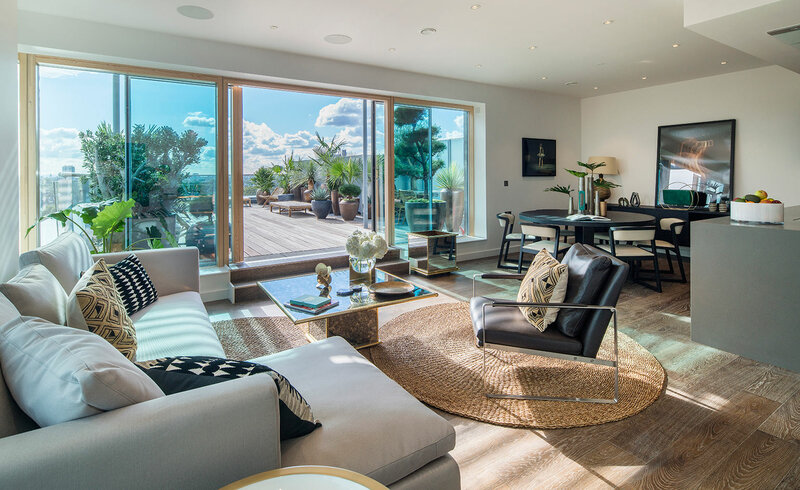 Inside, the series of modern apartments are topped by a set of six generous penthouses – three of which are still available to buyers. Absolute Flowers and Home designed the interiors of the penthouse show home, using a contemporary aesthetic and high quality materials, such as porcelain tiling, matt-finish cabinets, Corian worktops and brushed steel splashback surfaces. All apartments, including the penthouses, have outside space and there is the option of buying the properties furnished, or empty. Designer and stylist Tamzin Greenhill worked on all other private interiors (common areas were created by Simpson Haugh), which have proven extremely popular, with the vast majority of them now sold and most already occupied. With Queen’s Park Place all ready and up and running, no doubt exciting times await this part of north west London.